Last week I looked at a very low mileage 2001 SL500Â and today’s car is another SL, although a little newer and with a lot more power. The R230 SL55 AMG was the exactly what you would expect from a mid-2000sÂ AMG car: a supercharged V8 that makes almost 500 horsepower and just as much torque. Now 13 years and well over $100,000 worth ofÂ depreciation later, these top down monster have become very cheap. But is it worth it? 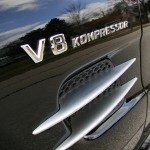 Those of you regular readers of GCFSB probably know that I mostly write about Porsche 928’s. Today I have something different, albeit quite similar. Much like the 928, the SL55 is ostensibly a grand tourer and is powered by a V8 of the same displacement as the 928 GTS. Both cars also share a very similar interior layout, with most of the controls located in a sloping and raised center console. Both cars are also beloved by Jeremy Clarkson, who spoke favorably of the 928 in one of the final episodes of Top Gear, and who personally owned an SL55. Describing his SL as a swiss army knife, Clarkson pointed out that the SL can act as a grand touring car if so desired, but can also be turned into a roadster in 16 seconds thanks to a retractable hardtop. 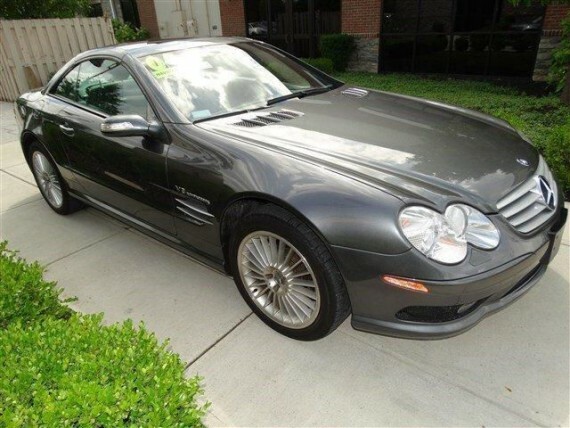 This Designo Graphite 2005 SL55 stood out to me for multiple reasons. The beautiful Designo color combination and interior upgrades, the unique Alphard wheels, and the low mileage differentiate this SL55 from the others currently on the market. 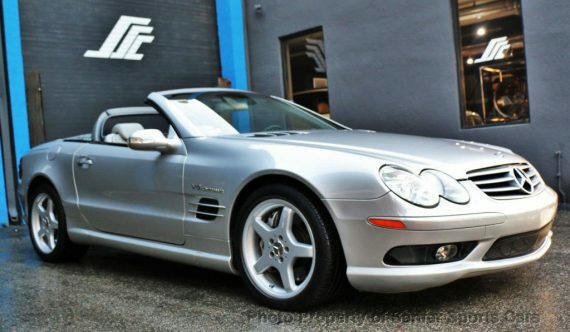 The Designo options on this car would have likely added an extra $8,000 onto the $120,000 base price for the SL55. Such options would include a full leather interior (dash, door panels, rear storage compartment, roll bar, and top lid), alcantara headliner, suppler leather on the seats, and black birdseye maple wood trim. This was a huge improvement over the mostly MB Tex and vinyl interior on a standard SL55. Basically, it is a combination of the higher quality finishes available on the SL600 with the more flashy design of the SL55, a win-win in my opinion. AMG Mercs have always been among my favorite German performance machines (second only to Porscheâ€™s). They are basically German muscle cars. In fact, since the golden era of American muscle died off many decades ago, I consider AMGâ€™s to be the muscle cars of the 21st century. Furthermore, while they may be prohibitively expensive when new, these cars often go for a song on the secondhand market. 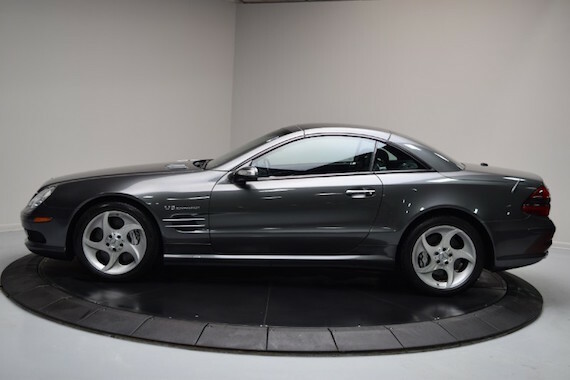 With only 12,000 miles on the clock, 493 horsepower, and 516 lb-ft of torque, this pristine SL55 could certainly give a new owner a ton of fun for a very affordable price. Furthermore, it is a rare Designo Espresso edition. While many may dismiss this as a mere appearance package, it adds an entirely different level to the interior. Standard SL55â€™s came with leather seats and leatherette pretty much everywhere else, such as the dash, door cards, center console, etc. This Designo edition, however, has very supple leather on practically every surface of the interior. On the outside, the Designo Espresso edition wears a very attractive dark brown metallic paintjob. The two Designo paint schemes at the time (Graphite and Espresso) offered more metallic flake than standard metallic Mercedes offerings. This becomes particularly obvious when the sun shines on the surface just right…it really does look spectacular in person. 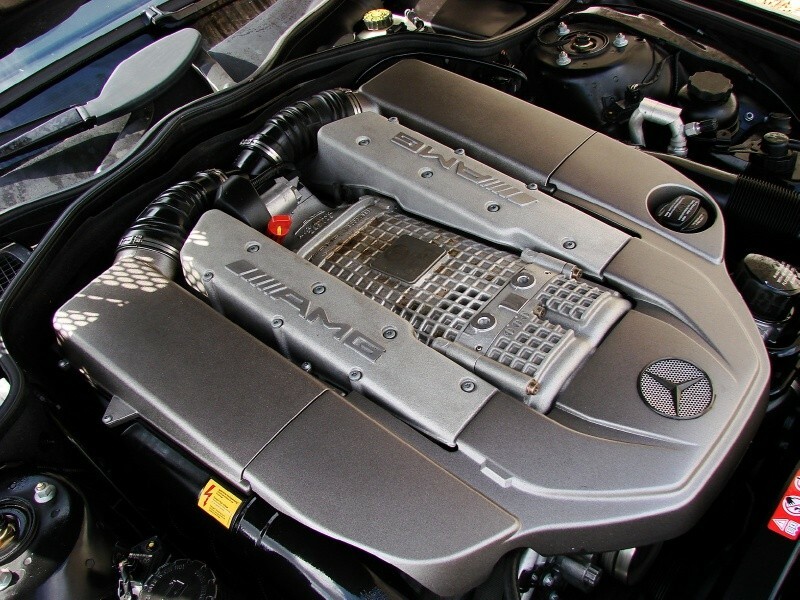 With AMGâ€™s integration as an in-house tuner in the mid-1990s, the division began to unleash itâ€™s fury on the lineup on vehicles such as the C, E and CLK class. 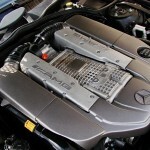 Perhaps one of my favorite AMG models of recent memory is this one: the SL55 AMG. Packing the supercharged 5.4 liter V8 tucked away under sleek, new sheet metal, these roadsters emitted quite an impressive soundtrack out of their quad exhaust pipes. 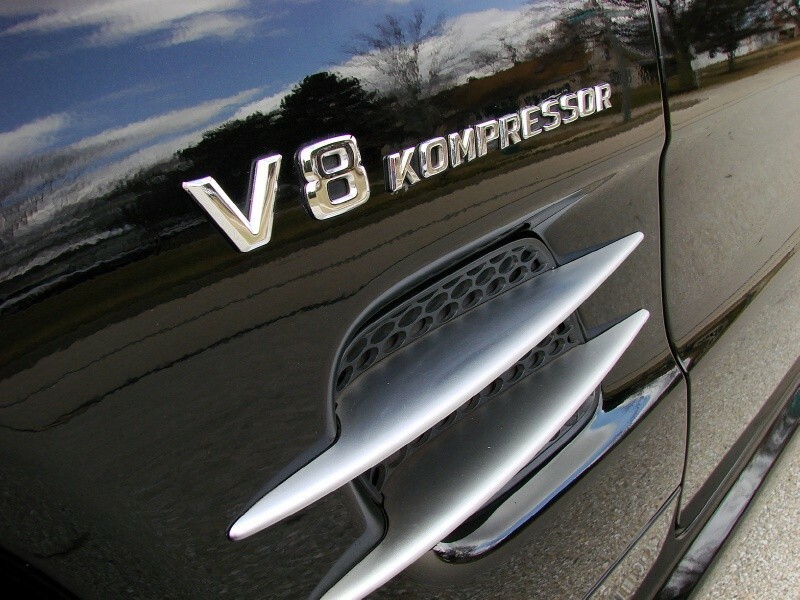 Sold from 2002 to 2008, they were usurped by the SL63 AMG, which was normally aspirated. While the SL63 was undeniably fast and quite a looker, somehow, it seemed a bit less aggressive without that signature wail from the blower on full throttle. 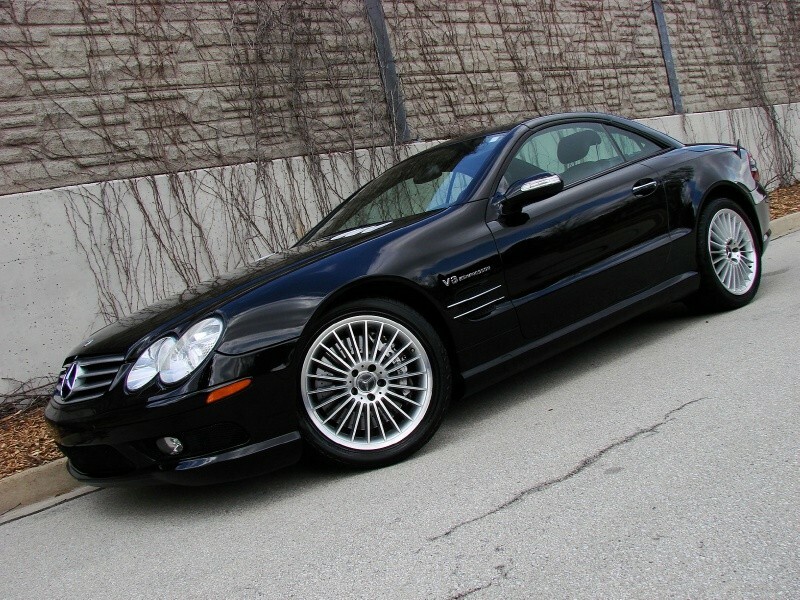 Today, the SL55 is a relative supercar bargain, such as this black one for sale in Illinois. Thank you for visiting another one of International Car Center’s online listings! 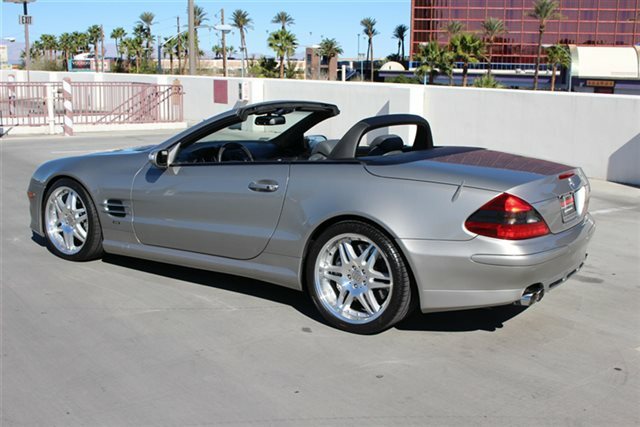 Please continue for more information on this 2005 ONE owner Mercedes-Benz SL-Class 55 AMG with 55,715 miles and available service records. Complete tune up and front rotors/pads back in August of 2011. When your newly purchased Mercedes-Benz from International Car Center comes with the CARFAX BuyBack Guarantee, you know you’re buying smart. 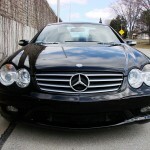 This is a well kept ONE-OWNER SL-Class 55 AMG with a full CARFAX history report. The SL-Class 55 AMG is a well-built, yet compact and enjoyable ride that is unmatched by any other convertible on the road. With the ability to easily switch between having the top up or down, you’ll be able to go about your weekday routine without feeling like you’ve sacrificed the weekend thrills. This SL-Class 55 AMG’s level of quality is not meant for just anyone. It’s meant for the person who strives for a classy, comfortable, and luxurious car. This vehicle has had only 55,715 miles put on it’s odometer. That amount of mileage makes this vehicle incomparable to the other vehicles on this market and is ready for you to come and see at International Car Center. With all records included, drive away confidently knowing the complete history of this Mercedes-Benz SL-Class 55 AMG. Adjectives like impeccable, spotless, and immaculate can be used to describe how clean this SL-Class 55 AMG is, causing it to feel more like a new vehicle than a pre-owned one. If you’re in the market for an incredible Mercedes-Benz featuring an Entertainment package that will surely keep your passengers enthralled, then you’ll definitely want to check out the Mercedes-Benz SL-Class 55 AMG. 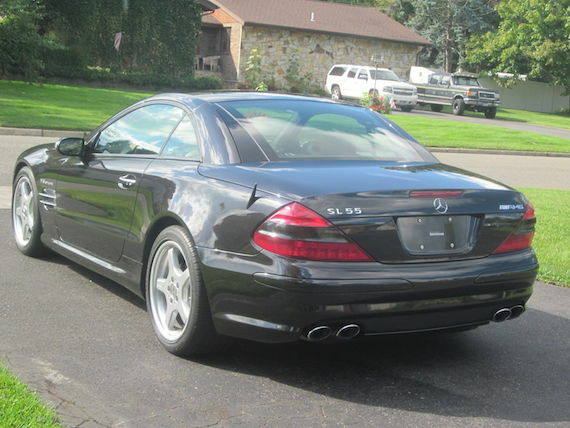 Fast and exciting, this SL-Class 55 AMG is a true testament to the pursuit of automotive distinction by Mercedes-Benz. Once you’re behind the wheel of this incredible machine, you will not think twice about purchasing this vehicle from International Car Center. When this vehicle was shipped from the factory, Mercedes-Benz decided that no option should be left off of this magnificent automobile. So, if you’re in the market for a SL-Class 55 AMG that is equipped with copious amounts of options, then International Car Center may just have the perfect vehicle to suit your needs. 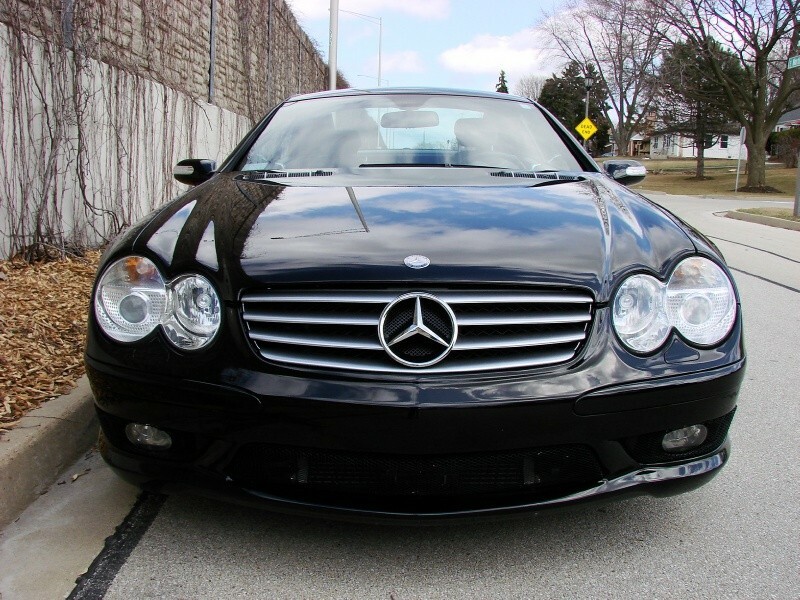 Find the quickest driving route in this SL-Class 55 AMG using the installed navigation system. This nav system is one of the easiest to use and will help get you where you need to go quickly! This Mercedes-Benz smooth ride is enhanced by the newly installed tires. The SL-Class 55 AMG’s new tires, offered to you to by International Car Center, is just another added bonus to this excellent car. There is no evidence of prior damage or paintwork on this SL-Class 55 AMG. 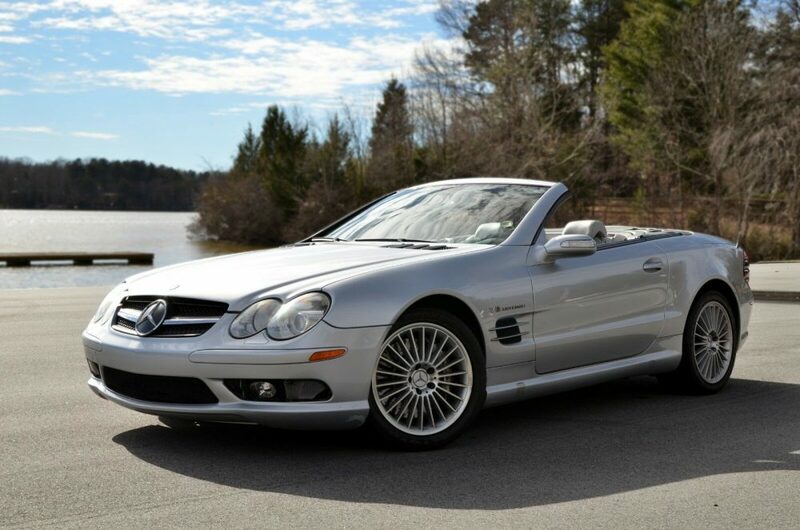 You’ll instantly stand out with this hard-to-find 2005 SL-Class 55 AMG. Be sure to prepare yourself to get noticed in this ultra rare SL-Class. One thing about this car that gets me is the wheels. They certainly look great and are a nice contrast to the black paintwork, but I could imagine myself spending an inordinate amount of time cleaning them all. The good thing about used SLs is that many are used as second or third cars, so mileage is usually low, as is the case here. At a touch under $35,000, this one is probably a bit overpriced for a car closing in on 60,000 miles. Somewhere in the high $20k range to the $30k point is more like it in this market.